[Q:] "Your Honor the President… we will ask you about the circumstances of the issue of Martyr (Shahid) Basel Al-A'araj (i.e., head of terror cell killed while shooting at Israeli soldiers who came to arrest him, see note) and his five comrades that is preoccupying the Palestinian street... Do we understand from Your Honor that the security coordination between you and Israel was not the reason for Basel Al-A'araj's death as a Martyr?" 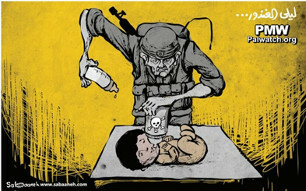 The cartoon shows an Israeli soldier removing a bottle from a baby’s mouth and replacing it with a bottle marked with the skull and crossbones symbol for poison. The cartoon refers to Laila Gandour, an 8-month-old Palestinian baby girl who died on May 21, 2018, at the March of Return riots on the Gazan border with Israel, to which her family had brought her. The Palestinians have claimed that she died of tear gas inhalation; however, she suffered from existing health conditions and the cause of death has not been determined. Pictures of Gandour and her funeral have become a symbol of the border riots. 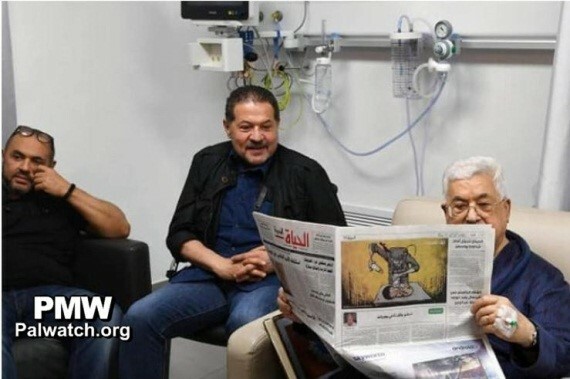 The day after the cartoon was published, a picture was taken of PA Chairman Mahmoud Abbas reading the official PA daily while hospitalized in Ramallah, and this cartoon was clearly visible on the back cover. This picture of Abbas has been widely disseminated in the media, possibly to show him being well after being hospitalized with pneumonia. 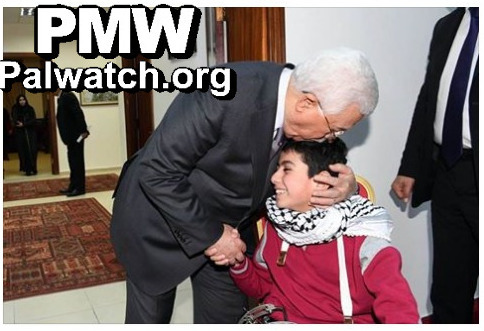 PA Chairman Mahmoud Abbas: "The sons of Jacob were 12. Where did you bring 13 from? They invented it. Where? In the Khazar Kingdom. When? In the 9th century. It was an irreligious kingdom. Afterwards it became a Jewish kingdom. The emperor converted to Judaism and therefore [the kingdom] converted to Judaism. Afterwards it broke apart, and all its residents migrated to Europe, and these are the Ashkenazi Jews (this claim is rejected by experts and genetic testing confirms uniform origin of the different Jewish communities-Ed.). The Ashkenazi Jews are not Semites, and they have no connection to Semitism or Abraham, Jacob, or others. It was a Tatar-Turkic state... Second, these Jews who migrated to eastern and western Europe were subjected to massacres by some state every 10 to 15 years from the 11th century until the Holocaust that took place in Germany. OK, but why did this happen? They say: 'Because we are Jews.'... The hatred of the Jews is not due to their religion, but rather due to their social role. If so, it's a different issue. And therefore, the Jewish problem that was common in all of the states of Europe against the Jews was not due to their religion, but rather due to their social role that was connected to usury, and banks, and so forth... Now we are talking about the Jewish homeland. They are talking about longing for Zion and that's why they are going [there] and so forth. 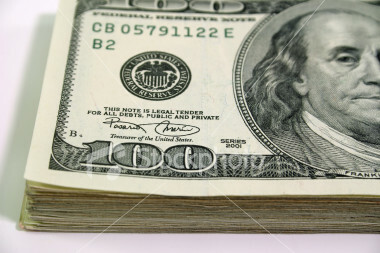 I say - not me, rather history says that these words are baseless." 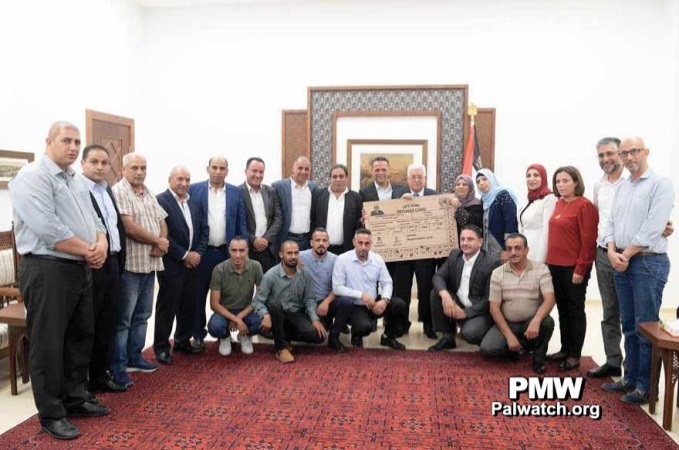 Headline: "The [PA] president: Palestine is a role model of coexistence and social peace"
"[PA] President Mahmoud Abbas received a delegation of clergy who represent the three monotheistic religions in Palestine at the [PA] presidential headquarters in Ramallah yesterday [Sept. 13, 2018]. The president welcomed the religious leaders and emphasized that Palestine constitutes a role model of coexistence and social peace, which emphasizes that this people deserves an independent state of its own – whose capital is East Jerusalem – which will be open to all of the monotheistic religions." Abbas has continuously condemned Jews "defiling" the holy sites with their "filthy feet." Other PA leaders have made similar statements. 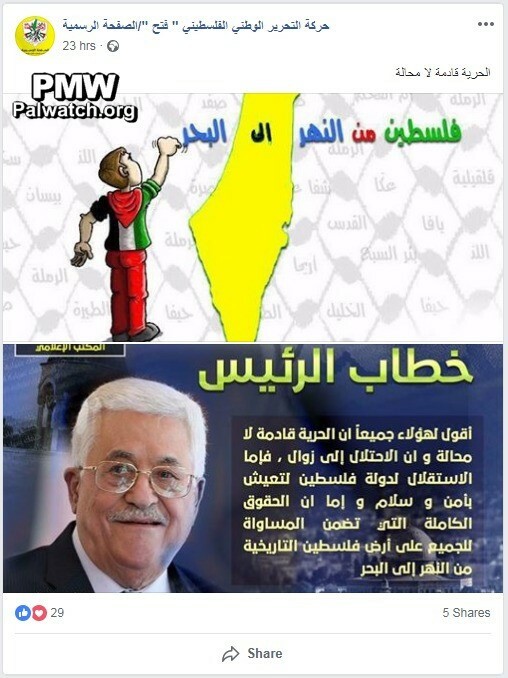 PA Chairman Mahmoud Abbas: "We have an additional matter and it is important, and I think it needs to continue. I don't impose my decisions on the [PLO Central] Council. The council is free to make the decisions it wants. We have the conversation with the supporters of peace in Israel, the conversation with the supporters of peace in Israel. A group of young men and women are responsible for it, women and men who are speaking with the supporters of peace in Israel, or [with] those who are expected to be supporters of peace… We must try, we will continue with these meetings because they are beneficial meetings. After all, with whom do we seek peace? With the State of Israel – or not? If there will be [two states,] Israel and Palestine, we will need to coexist and speak with each other. So let us speak with each other from this moment, and we are continuing the conversation, and it is not connected to [Israeli Prime Minister Benjamin] Netanyahu rejecting peace. We must maintain these actions." PA Chairman Mahmoud Abbas: “We also always say that we adhere to negotiations as a way to reach a political arrangement with the Israelis. In other words, we do not want war. We will not call for a military war between us and Israel. Everyone knows that we are among the official parties in the world that are fighting violence and terror throughout the world... We are the ones who are disseminating the culture of peace instead of war, and that is how our people is now characterized. Therefore, you see that all of the demonstrations that have been held in the Palestinian territories have been peaceful demonstrations (sic., the demonstrations have included rioting and rock throwing, and been accompanied by stabbings and stabbing attempts)… We want peace with Israel. Israel is our neighbor and we want to make peace with it and live in peace with it.'" Headline: "Abu Rudeina: Jerusalem is the key to war and peace, and the region stands before difficult decisions"
"[PA] Presidential Spokesman Nabil Abu Rudeina said that any just solution must include East Jerusalem as the capital of the independent [Palestinian] state, and emphasized that not reaching a solution to the Palestinian issue will cause a continuation of the situation of tension, anarchy, and violence that is prevailing in the region and the world."